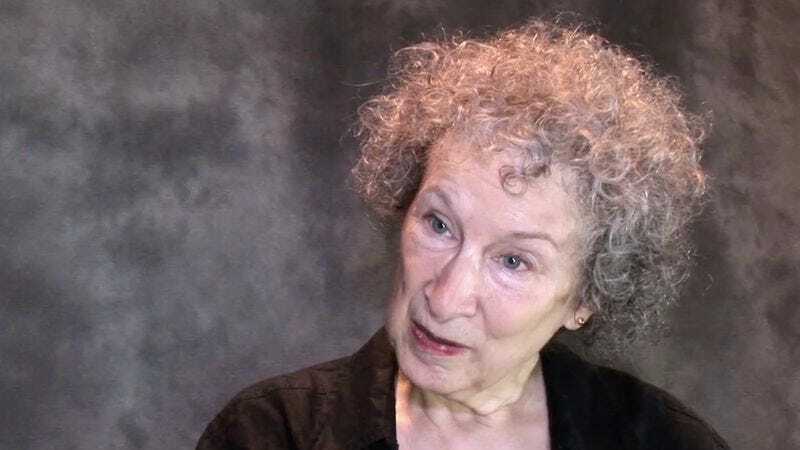 Multitudinous-award-winning author Margaret Atwood has presumably reached the point in her career where it’s time to take a break from producing conventionally respected literature and start working on a graphic novel trilogy about a superhero whose genome is an amalgam of hominid, feline, and avian DNA. Thus, humanity will be blessed with the soon-to-be-released Angel Catbird, from Dark Horse Comics. “I have concocted a superhero who is part cat, part bird,” Atwood explained in an official announcement from the press. “Due to some spilled genetic Super-Splicer, our hero got tangled up with both a cat and an owl; hence his fur and feathers, and his identity problems.” The Canadian novelist—who was the first recipient of the highly prestigious Arthur C. Clarke Award in 1987 for The Handmaid’s Tale—is clearly embracing the medium with full force. Acquiring editor Daniel Chabon describes Atwood’s contribution to comics as “a strange mix of Will Eisner’s The Spirit, Grant Morrison and Chas Truog’s Animal Man, and Ryan North and Erica Henderson’s Squirrel Girl,” which, if you’re familiar with any of those references, should suggest to you that it will be a bit skewed. “Angel Catbird is a humorous, action-driven, pulp-inspired story. And the only other thing I can tell you at this early date is to expect a lot of cat puns.” What else could we even hope for?